The definition of the four use case scenarios, and the corresponding user and high-level requirements, that will be carried out. The definition of the Reference Architecture for the A4BLUE Platform paving the way to further implementation activities and the validation of the technical solution in the four identified business cases. The initial definition of a methodology for socio-economically sustainable design of optimal automation levels in assembly systems. Stakeholders analysis, standardisation landscape, market analysis, and initial exploitation plan. 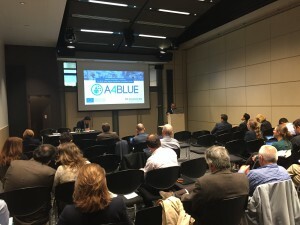 Moreover, all partners participated in the dissemination and communication activities, promoting the A4BLUE project in several international events and exhibitions, raising interest among key stakeholders. These sets of activities comprised steps to scope the design of the evolvable work system solutions. First, multi-dimensional requirements were established: ‘user-level’ requirements were gathered via a cross-organisational opinion survey on digital manufacturing technologies, and ‘high level’ requirements were specified via a review of European legislation and standards. Together this data generated a framework to guide the design of the A4BLUE solutions, covering not only current legal and ethical obligations but what is considered essential / desirable by the stakeholders who will be involved in future implementation and operation. Second, the four use case scenarios to be used for the development of the systems were specified following observational visits to each of the host facilities to gather information about the current state and requirements of candidate processes, and through ongoing collaborative scoping and data collection discussions between the technical and use case partners. 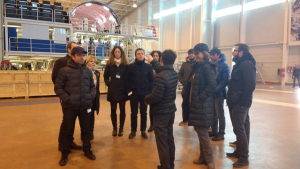 The four selected use cases consist of two real industrial scenarios, at Airbus in France and CESA in Spain, and two laboratory based scenarios, at IK4-TEKNIKER in Spain and RWTH Aachen University in Germany. Third, the impact that the A4BLUE solutions will achieve was assessed by first defining the starting situation of each of the four scenarios and then comparing this benchmark with the anticipated situation for future systems using qualitative non-economic ‘utility analysis’ with criteria identified from the literature. All four scenarios will comprise new work systems with adaptation capabilities to accommodate process and human variability, but each has a unique manual assembly application for which automation advantages are being predicted. Technical activities and aspects of the project linked to the conceptualization and the architecture are led by Engineering in collaboration with IK4-TEKNIKER, RWTH Aachen University, Illogic, KOMAT. The aim is to set the technical framework, from which all the other technical activities will follow. The framework is based on the Reference Architecture (RA) for the A4BLUE Platform, paving the way to further implementation activities and the validation of the technical solution in the four identified business cases (i.e. AIRBUS, CESA, IK4-TEKNIKER and RWTH Aachen University). The activities carried out during the first year of the project were focused on firstly defining the A4BLUE Reference Model. Starting from defining a grounding glossary, common concepts and principles (Specifications) have been set and then it has been started the description of the elements of the architecture at a conceptual level (Reference Model). All the technical partners have been involved in the collection of all the relevant information regarding Functional Building Blocks in order to create a common vision on the components/modules and the functions/services provided/consumed. 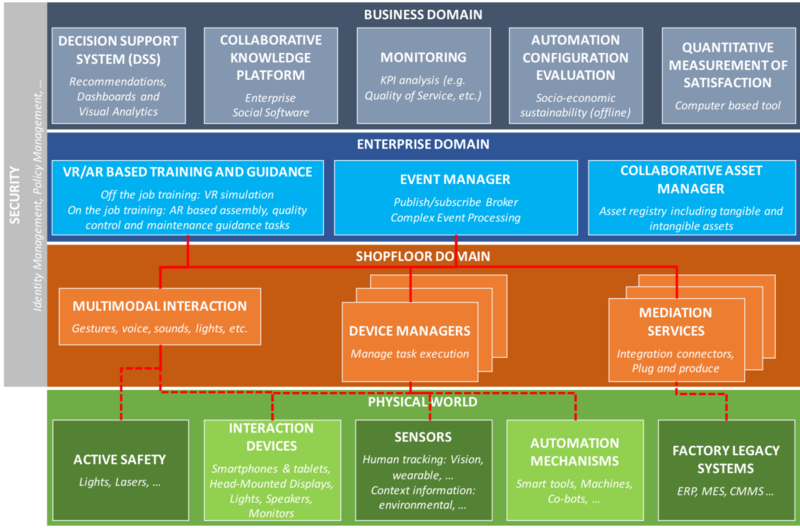 According to the A4BLUE RA, the functionalities of an adaptive assembly system have been decomposed into three high-level Functional Domains – Shopfloor, Enterprise and Business (see picture below) were domains define a coarse mapping of system elements to either the factory – Shopfloor Domain- or the broader world of corporate IT – Enterprise or Business Domains. 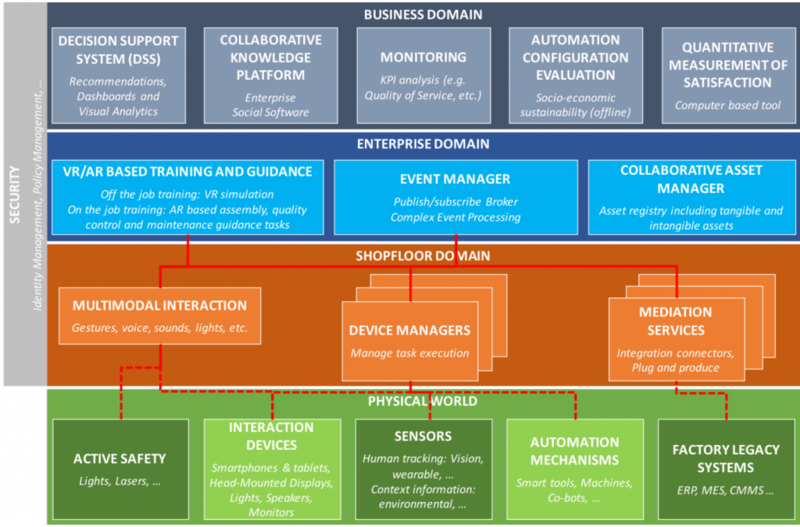 Shopfloor Layer is the lower layer and is intended to ease the interconnection of the A4BLUE Platform with the physical world, by hiding the complexity of dealing with shopfloor IT systems (e.g. PLC, CPS and existing legacy system) as well as dealing with human interactions (e.g. using gesture and voice commands). Enterprise Layer is the middle layer and represents the core part of the A4BLUE Platform, being in charge of managing the core components needed for adaption management using an Event Driven Architecture in order to provide the assistance services. This layer will be also enhanced by tools supporting the tactical decision-making processes by producing and consuming digital information coming from the other layers. Business Layer is the upper layer and is in charge of supporting strategic decision-making process (sometimes using off-line tools), targeting both blue- and white-collar workers. RWTH Aachen University is the partner responsible for overview the activities aimed at developing a Methodology for socio-economically sustainable design of optimal automation levels. With regard to the overall target of A4BLUE, it is crucial to connect economic and technical factors with usability and worker satisfaction to evaluate the optimum for adaptive and sustainable work places of the future. The methodological procedures are being developed in close cooperation and alignment with Cranfield University, before the partners IK4-TEKNIKER and Engineering implement the results in software solutions to integrate them into the A4BLUE Adaptive Framework. During the first year of project activities a systematic stakeholder analysis has identified the most important stakeholders within and around the A4BLUE value chain and assessed their position towards the platform. All stakeholders were invited to participate in an online survey, which was designed to measure stakeholder points of view about their interest, attitude, influence and knowledge relevant for the project and identify the main external ‘barrier’ and ‘enabler’ factors to user acceptance. It was released in English, Spanish, Italian and German to reach the maximum audience through project and partners means of communication. Then, the anonymous data were analysed and reported collectively. Another crucial topic faced was standardisation: both standards and standards under development related to the project topics were identified and classified for each standardization area, together with the technical committee responsible for the respective standards. 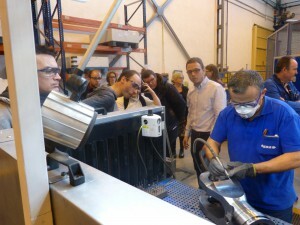 The search covered the European standardization developed by BSI, CEN, CENELEC, ISO and IEC. Thirdly, during the first year, all the consortium members were committed to integrate the knowledge and results generated in the A4BLUE project with market needs. Within this 1-year project, a preliminary market analysis has been conducted. In particular, partners provided an overview and market trends of the sectors where there is small scale production of complex products/parts. Finally, to ensure the market introduction of the A4BLUE solutions, all along the project, exploitable results were identified together with a preliminary way to manage them. A Preliminary IPR strategy has been also set up as the future basis of the business plans and models for exploitation. All partners are engaged in dissemination and communication activities in order to increase the visibility of A4BLUE towards potential customers or partners. With this aim, during the first year, partners joined several international events and exhibitions where they had the occasion to present project’s objectives and activities carried out so far. 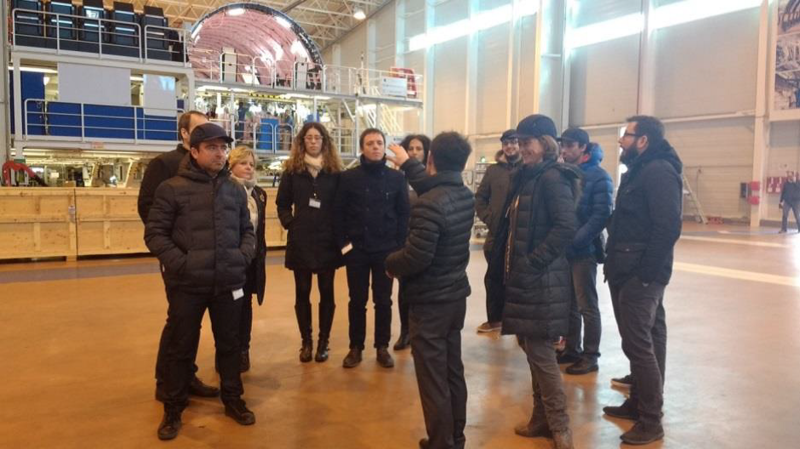 CESA Market Place at Airbus (Getafe, February 2017): Exhibition of CESA activities at Airbus facilities. Between all the posters, CESA shown one dedicated to R&D projects including in A4BLUE. EFFRA Factory of the Future Community Day (Brussels, 16 May 2017): The coordinator, IK4-TEKNIKER had the opportunity to give a short presentation on the project in one of the parallel sessions allocated to “Humans in Factories”. SPS ICP DRIVES fair (Parma – Italy – 24 May 2017): A4BLUE was presented to the industry sector together with the EU-funded projects INCLUSIVE, FACTORY2FIT, HUMAN and MANUWORK. Abu-Dhabi’s 1st Global Manufacturing and Industrialization Summit (Abu-Dhabi, March 2017): Illogic showcased A4BLUE project oversea joining this international event and exhibition dedicated to manufacturing capabilities that have revolutionised the manufacturing sector. Affidabilità & Tecnologia (Turin, May 2017): A4BLUE joined this International Trade Fair for the Manufacturing Industry for networking purposes. FARETE 2017 (Bologna, September 2017): A4BLUE and CiaoTech were present with a booth at the sixth edition of this exhibition organized by one of the largest Italian industry association.